Soups 13 Black bean soup. Boil 1 pt blk beans until very soft, & rub them through a sieve. 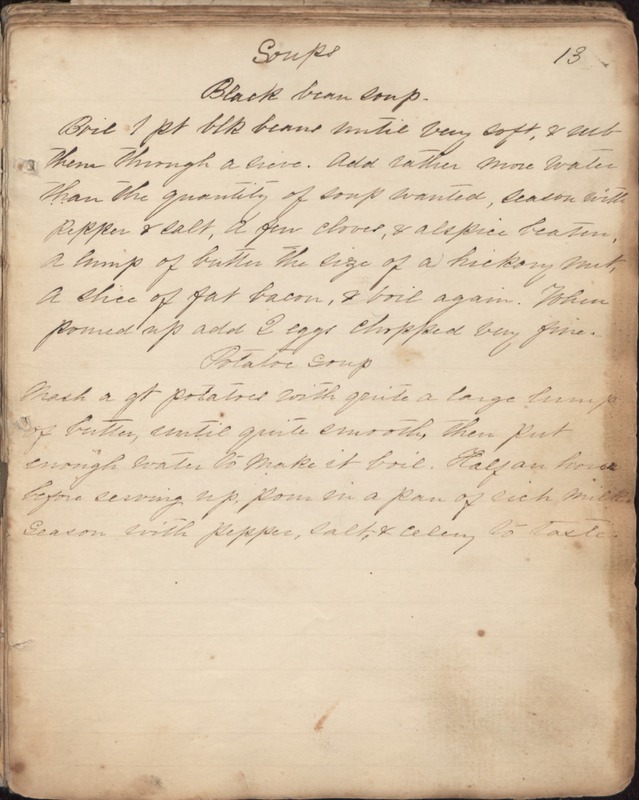 Add rather more water than the quantity of soup wanted, season with pepper & salt, a few cloves, & alspice beaten, a lump of butter the size of a hickory nut, a slice of fat bacon, & boil again. When poured up add 2 eggs chopped very fine. Potatoe soup Mash a qt potatoes with quite a large lump of butter, until quite smooth, then put enough water to make it boil. Half an hour before serving up, pour in a pan of rich milk. Season with pepper, salt & celery to taste.